Former Islamist president - together with Muslim Brotherhood leaders - sentenced 2011 jailbreak, spying for Hamas. An Egyptian court upheld the death sentence handed down to former President Mohammed Morsi on Tuesday. Five other leading Islamists from the Muslim Brotherhood - including Brotherhood leader Mohammed Badie - also had their death sentences upheld by the court. 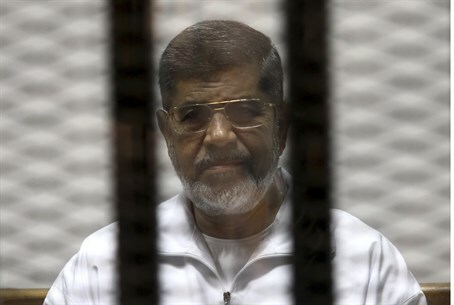 In addition to the death sentence ruling, the court also confirmed a lifetime prison sentence for Morsi over charges of espionage on behalf of Hamas and other foreign terrorist groups. Morsi's was sentenced to death along with dozens of others over a mass jailbreak during the 2011 uprising against the rule of his predecessor, Hosni Mubarak. In 2012, Morsi was elected president, but was deposed just one year later by yet another popular uprising, backed by the Egyptian military. Egypt's current leadership, headed by President Abdul Fattah al-Sisi, has cracked down hard on Islamist groups, including the Muslim Brotherhood and its Palestinian branch - Hamas - accusing them of fomenting armed rebellions against the government, particularly in the restive Sinai Peninsula, which borders Israel.